Should The U.S. Follow Britain’s Lead And Raise Taxes On The Rich? Why Do We Need A Millionaires’ Tax When We Have The AMT? Today, President Obama unveiled a plan to reduce the deficit by $4 trillion and pay for the new round of economic stimulus, the American Jobs Act, he sent to Congress last week. In a Rose Garden speech about the plan, the President repeatedly emphasized the idea that spending cuts need to be balanced with tax increases. What will likely be one of the most controversial elements of the plan is Obama’s proposal that individuals making over $1 million pay a certain minimum tax rate. Nicknamed the “Buffett Rule” after Warren Buffett’s advocacy of higher taxes for the super-rich, the proposal aims to rectify the fact that, due to the quirks of our tax system, some ultra-wealthy individuals pay lower effective tax rates than upper-middle income households. Guess what share of his income the third richest person in America paid in federal taxes last year? 45%? Maybe 38%? It has to be at least 25%, right? Actually, Warren Buffett paid 17.4%, a lower tax rate than any of the twenty other people working in his office, who paid an average of 36%. Interestingly, Buffett isn’t happy about his low tax bill. Two weeks ago he wrote an attention-grabbing op-ed in the New York Times asking Congress to please tax him and other super-rich folks more. So, just how does it happen that Warren Buffett pays a lower tax rate than his coworkers? It has a lot to do with how different types of taxes are structured. The super-rich make most of their income from earnings on investments, rather than wages paid for work (which is where the average, non-retired person makes most of her money). People who “make money with money,” as Buffett puts it, see much of their income taxed at the capital gains rate of 15%, rather than the highest personal income tax rate of 35%. People who earn more pay a smaller portion of their income in payroll taxes (the taxes designated for Social Security, Medicare, and unemployment), since Social Security taxes are only paid on income up to $107,000. According to the Urban-Brookings Tax Policy Center, Buffett’s point about the discrepancy between the tax rates on investment income and wage income is a valid and important one. However, most high-earners pay a higher tax rate than Buffett’s 17% and most low- and middle-earners pay a lower rate than the 36% Buffett’s colleagues pay. For Buffett to imply that all, or even most, wealthy people pay a lower tax rate than low- and middle-income people is inaccurate. The thing is, Buffett’s argument doesn’t really apply to your run-of-the-mill millionaires making $1 or $2 million a year. A lot of those people still earn most of their income from wages so they end up paying higher tax rates than someone making, say, $50,000. It’s the super-rich investors like Buffett who get the low tax rates. 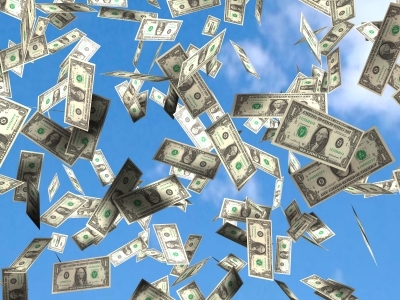 The average federal tax rate for the top 400 taxpayers is around 18%, which is significantly lower than the rate for someone making, for example, $180,000 or $1 million. 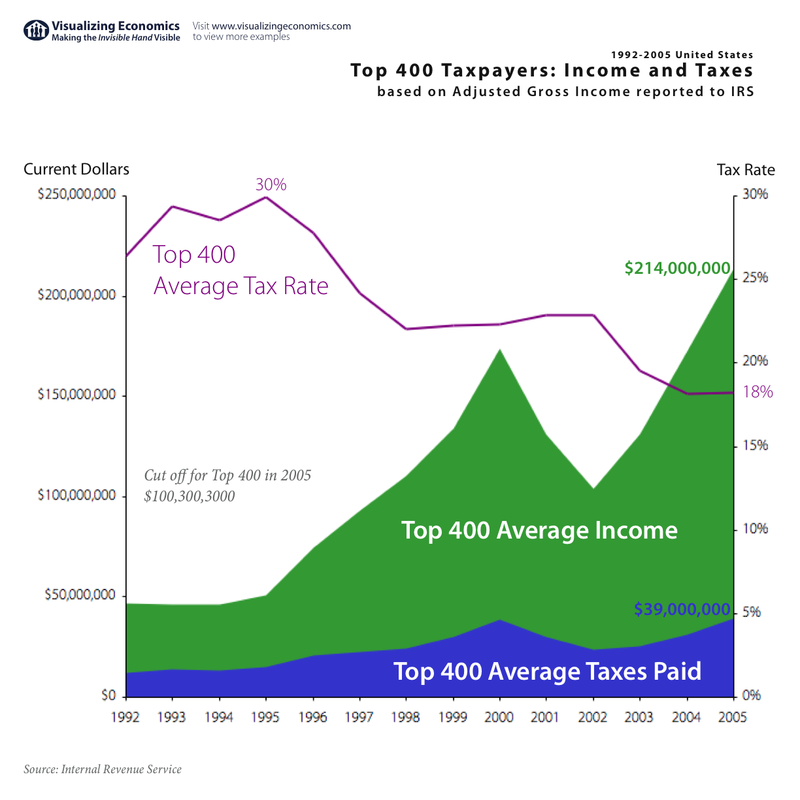 The graph at left, from the excellent blog Visualizing Economics, shows just how far the average tax rate for the top 400 taxpayers has dropped in the past two decades. Another thing Buffett has been criticized for is not mentioning the corporate income tax in his article. Corporations pay taxes too, at a rate of about 35%, but since corporations aren’t people the burden of these taxes gets passed on to actual humans – to investors in the form of lower returns on their investments or to workers in the form of lower wages. Buffett’s true net tax rate, some argue, is 17.4% plus whatever share of corporate taxes fall on investors. The problem is, economists can’t agree on who, investors or workers, bears what share of the corporate tax burden. Given this disagreement, perhaps Buffett was right to leave it out of his argument. Beneath all this is the question of fairness and how much every group should ideally contribute. For more on this, see one of my older posts here. Was Buffett Right? Do Workers Pay More Tax than Their Bosses? Taxes – What’s A Fair Share? If you were to redesign our tax system from scratch, what would it look like? What would each person’s fair share of the burden be? Our federal system primarily taxes individuals’ incomes, not their overall wealth. You pay taxes on your money when you earn it and you don’t have to keep paying every year on the things you buy with that income, like real estate and financial investments (though you do have to pay taxes on the capital gains you make when you sell these assets). Local tax systems, which are based mainly on taxing property, work differently – you pay taxes on assets you own, every year, as long as you own them. What’s interesting is that when you look at how the tax burden is spread across different groups, it reflects the distribution of wealth more closely than it does the distribution of income. The top 5% earn 35% of all income but pay a whopping 59% of all taxes. Sounds unfair, right? Until you consider that this group owns 64% of all the wealth in the country. Where does this pattern come from? The richest Americans’ share of overall wealth is higher than their share of income because they tend to have a greater portion of their wealth in assets (mainly financial investments, real estate, and business ownership), as opposed to middle- and low-income Americans, who have fewer assets and a greater share of their net wealth in the form of cash income. The wealthy’s share of income taxes is greater than their share of income because our tax system is progressive, meaning the affluent pay a bigger chunk of their earnings in taxes than people in the lower income brackets. There’s been a lot of discussion lately about whether increasing taxes on the wealthy should be part of the solution to our deficit problems. Let’s assume we stick with an income-based tax system; we can still ask ourselves: Should peoples’ taxes correspond to their share of income or their overall wealth? Do the richest Americans pay too much, or not enough?